The Supreme Court of Wisconsin recently issued its opinion in Chen v. Warner, 2005 WI 55 (May 6, 2005), affirming the circuit court’s conclusion that a physician-mother’s post-judgment decision to quit her employment to stay home with the children, with which whom she had shared equal placement with the physician-father, was not shirking. The decision affirmed an award of child support from her former spouse due to the mother’s lack of employment. This is the second of two articles analyzing this highly important decision. In the first article, I discussed the holding of the court and the reasoning of the two dissenting opinions. In this article, I will analyze the holding and discuss its possible implications. As discussed in the previous article, the case involved an unusual fact pattern involving the divorce of two Marshfield physicians, John J. Warner and Jane E. Chen, both earning substantial incomes. Agreeing upon an equal placement schedule for the children, the parties stipulated to a hold open in child support. Subsequently, the wife decided to voluntarily leave her employment and live off her investments. When the stock market declined, so did her income. She then asked for and received a child support award from her ex-husband, even thought the only change in circumstances was a self-inflicted one. The Wood County trial court order was affirmed by the Court of Appeals and now by the Supreme Court. 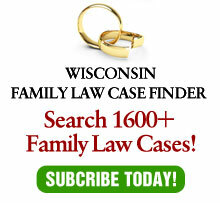 The issue of “shirking” is both a frequent and a difficult one in family court actions. Many employment decisions are made for reasons other than maximizing income, including future potential, professional enhancement, lack of stress or simply pure enjoyment. Yet when there is a support obligation, the immediate suspicion of a party choosing employment on any basis other than maximum income is that the party is “shirking.” See “Without Intent: Developments in Defining Shirking,” 13 Wisconsin Journal of Family Law 100 (1993). In my article last year critiquing the Court of Appeals decision, I suggested that the court adopt “a consistent rationale for family law cases involving choice of income. And, this rationale should be based upon fairness and equity – not semantics.” See “Court’s Consideration of ‘Shirking’ is Exercise in Semantics,” Wisconsin Law Journal, June 9, 2004. Although the Supreme Court did indeed adopt a rationale by providing of list of factors, it did so within the rubric of a “shirking” analysis. Then, it upheld the trial court decision that the wife was not shirking under the circumstances of this case. At first glance, the majority decision of the high court does not seem that dangerous. The lengthy list of factors to be considered by a trial court provides a wide range of discretion. The final catch-all of “anything else the court thinks is important” (these catch-alls make one wonder if the preceding factors are needed at all) should avoid handcuffing a court’s use of that discretion by allowing the court to analyze each fact pattern individually..
Why, then, is this case so troubling? Perhaps because it violates the old rubric of “bad facts make bad laws.” Few divorce cases involve two physicians making substantial incomes. Few wives have the resources to leave their job voluntarily without modifying their standard of living. Few ex-husbands have sufficient income to be able to adequately support the children without their ex-wife working. More typically, even with both spouses working, there is insufficient income to go around. The unusual nature of this case serves as large part of the dissents by Judge Charles Dykman at the Court of Appeals and Justice Louis Butler at the Supreme Court. As a result, it is not so much a criticism of the result in this case that is troubling. Dr. Warner can certainly afford to pay child support. The feeling of unfairness arises from the concept that Dr. Warner has to pay for the mistaken judgement by his ex-wife. The effect is that she is rewarded for being irresponsible and he is punished for being responsible. After all, the same result would be highly unlikely if he had quit his job at the same time as his ex-wife. Even more disturbing is the prospect of this case being cited in other scenarios without this level of income. Many, if not most, parents would prefer to spend more time with their children rather than at work. They are unable to do so because of financial constraints. Good divorce lawyers typically explain to clients that quitting their jobs voluntarily to spend more time with their children is not a good basis for an increased child support order. After Chen, that advice will change. If the other spouse has a substantial income and the client can justify quitting the job to spend more time with the children, rather than the wrath of the court, the client may find approval by the court. Most likely, trial courts will likely utilize the factors in Chen to discourage parents from voluntarily leaving employment. Whether that actually occurs – and the extent to which litigation is needed to convince parents not to leave their jobs – only time will tell.